Traversing high above the Zion Lodge is a trail with panoramic views of Zion Canyon. This trail is a nice respite from the crowds in the main Zion Canyon. 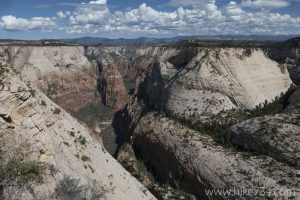 Accessing the bird’s-eye view of the lodge as well as unique views of the Emerald Pools, Sand Bench, and The Great White Throne is from Deertrap Mountain along the East Rim Trail. Starting on the East Rim Trail near the East Entrance of Zion, you travel along a broad trail through slickrock and desert shrubbery. The trail starts off fairly level with some soft, sandy spots along the way. The trail switchbacks at Cave Canyon and begins to climb. You wrap around the point that separates Cave Canyon and Jolley Gulch, with the latter being an impressive canyon. At almost three miles, the trail crosses Jolley Gulch. At the crossing, you stand on a rock slab that looks straight down into a writhing fissure. Years of water eating away at the sandstone have created a dramatic slot canyon to enjoy from a great vantage. The wide trail continues to climb up onto the plateau. The contrast between the sandstone with desert brush and the ponderosa pine forest is fantastic as you move from valley floor to high perches. Views of the surrounding summits are impressive and constantly changing. Eventually, the trail traverses the plateau and heads in among stately ponderosa pines. It then drops down towards the intermittent Stave Spring. In this area, a sawmill once stood when the rim was logged and the timber was supplied to the canyon by the “draw works” at Cable Mountain. Follow the signs immediately after the spring to the left, heading west towards Deertrap and Cable Mountains. The terrain opens up as you climb out of the ponderosa forest. After a little over a mile, the trail forks with Deertrap Mountain Trail heading off to the left. The trail goes up and down as it traverses the plateau. Grassland and shrubs dominate the landscape while intermittent views of surrounding mountains, cliffs, and valleys keep it from becoming mundane. After traversing the plateau, you reach the edge of the canyon wall and the views go from interesting to incredible. 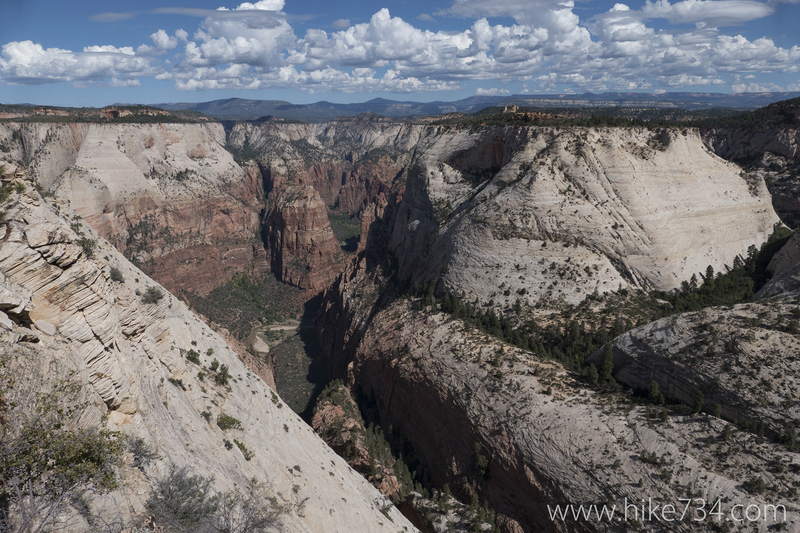 Right where the trail first comes to the edge of the cliff, you can look directly down onto Zion Lodge. Across the canyon are views of the Sand Bench Trail and the Emerald Pools. Peaks along the canyon rims are visible everywhere. Mountain of the Sun dominates your view at eye level, as well as the prominent rock features known as the Court of the Patriarchs. The trail continues to traverse along the ridge and ends in a clearing. The Great White Throne stands prominently with a distant view of Angels Landing. One last option is to access these trails from the dirt roads on the privately owned Zion Ponderosa Ranch. This route is considerably shorter in distance and less vertical overall. 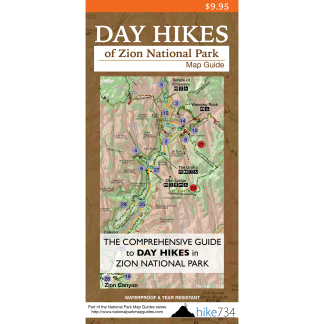 Getting to the trail involves a five mile drive along the North Fork Road east of the Park’s East Entrance, then a left turn onto the signed dirt road to Zion Ponderosa Ranch & Resort. This road is on private property, so please be respectful to the landowners and stay on designated roads and trails. Signage is limited, so refer to the map and follow the more heavily used roads to get to the trailhead. Rainy conditions or snow covered roads may make the road impassible with a car. Trailhead: From Springdale, take Highway 9 east through the Zion-Mount Carmel Highway Tunnel. Make a left at the turnoff on the north side of the road just before the East Entrance. The trail starts at the gate at the end of the parking lot.